It’s a guy thing. I am sorry but it is true. 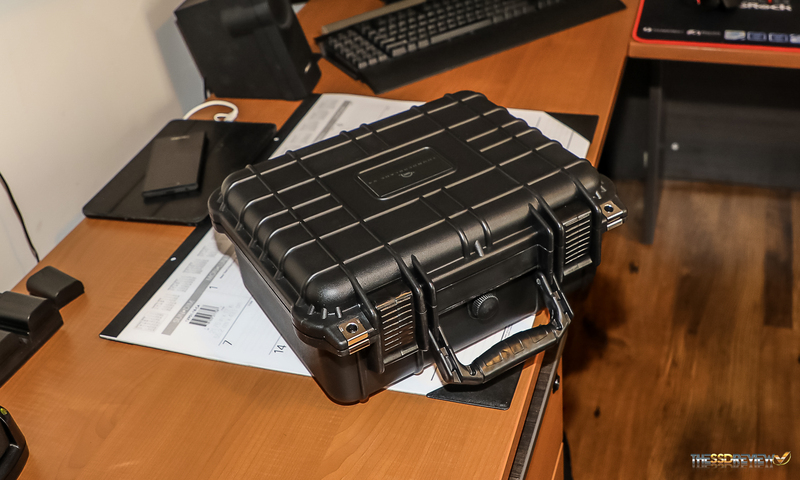 When you arrive home to discover that a ballistic case has been delivered in your absence, the sun shines once again. 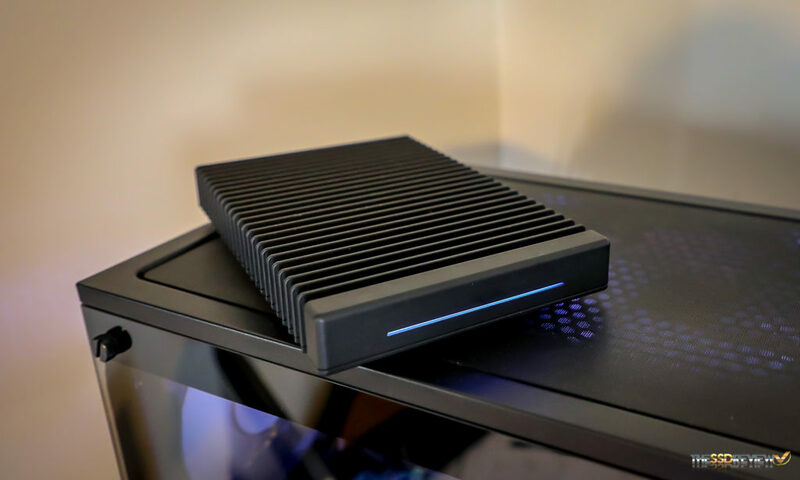 I will be the first to admit I hadn’t a clue what was contained within but, as soon as I discovered that this was the case for the new OWC ThunderBlade V4 4TB Storage Device, I knew it would be a long week of testing. 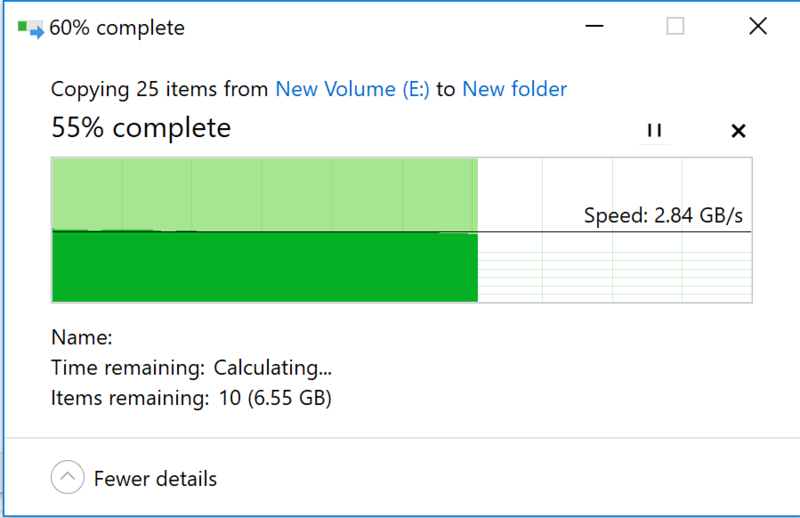 Yup… 2.84GB/s and I repeated this test like 10 times, rebooting the PC more than a few, just to ensure this was happening. Truth be told, I have an even higher result at 2.9GB/s. 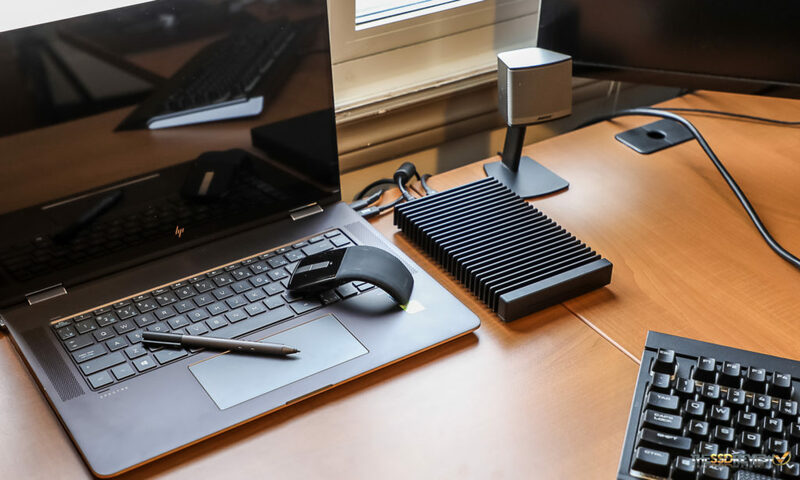 The appearance of the OWC ThunderBlade V4 is as attractive as that ballistic case and is flat black black metal, measuring 7.5″ long x 5″ wide by 1″ high and its shape serves the purpose of a heatsink, dissipating the heat from the SSDs inside. The ThunderBlade V4 comes contains an LED on the front which shines white when plugged into a Thunderbolt 3 source that is off, or in in sleep or hibernation mode. 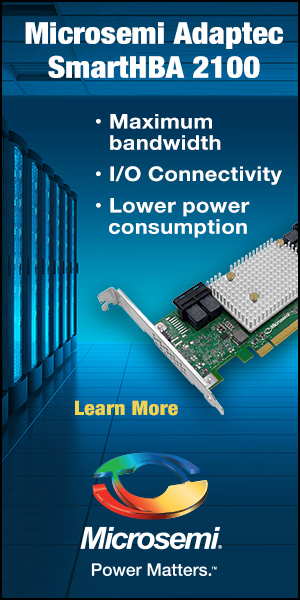 When the host system is active and the ThunderBlade v4 receives power, it will display a blue band across the front, sections of which will flash as each of the SSDs are being utilized. 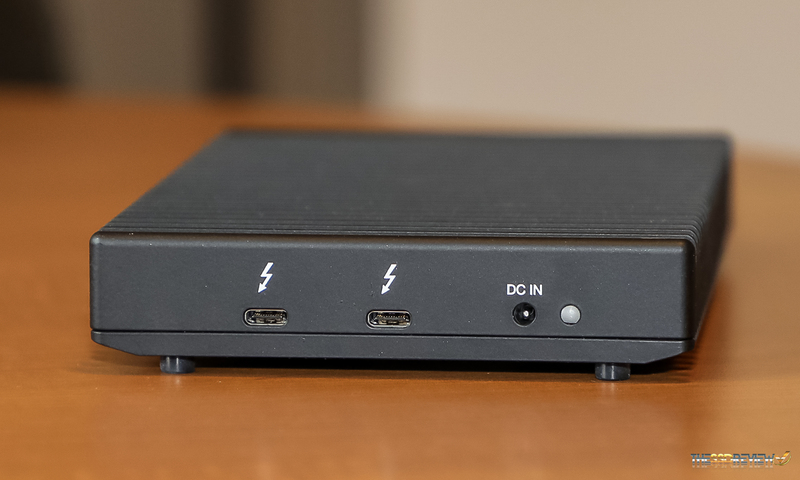 The back of the ThunderBlade V4 contains two Thunderbolt 3 ports which can daisy chain up to 6 Thunderbolt 3 devices, a power port as well as an ambient light sensor that adjusts the brightness of the front LED, depending on room lighting conditions. 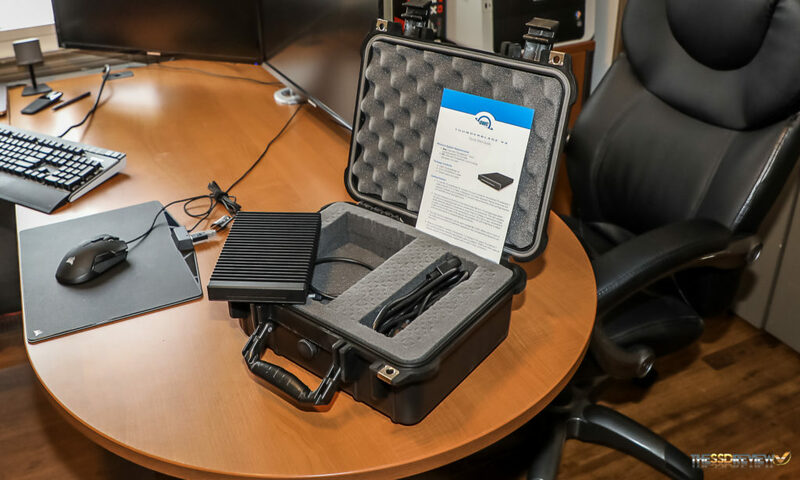 The ThunderBlade V4 is available in capacities of 1TB ($1199.99), 2TB ($1799.99), 4TB ($2799.99) and 8TB ($4999.99) and comes with a 3 year limited warranty along with OWC’ 24/7 call in support. As well, a 0.5m Thunderbolt 3 cable and power adapter is included with instructions to get her up and running quickly. A licenced copy of OWC SoftRAID XT is also included in the package. Come on, 3 years?? That should be ONE star!!!! That is a joke! Should be at least 5 year warranty, or better 10 years for that price. 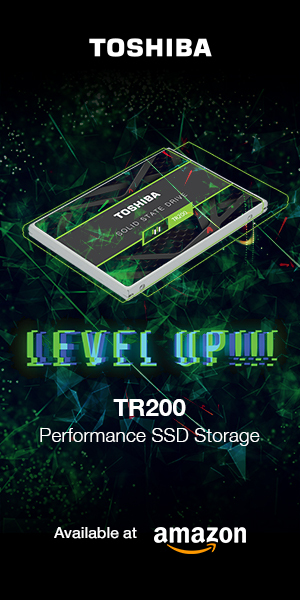 For the 3 year warranty, forget it, I will build my own and will be 10 year warranty for the ssd. And it will not bog down with a lot of writes like this one.